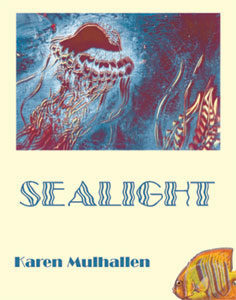 Karen Mulhallen, the renowned editor of Descant Magazine, one of Canadian’s best periodicals, is an accomplished poet. She turns her attention in this newest book to poems which sweep from such large themes as the beginnings of the world, the birth of the oceans, the seas and the birth of the moon to such concerns as Cosmology, the family, diving, winds, death, reading the clouds, the Toronto Islands and the San Andreas Fault. Into this work she pours her experience with learning and absorbing the world around her. She writes about the Vikings journeying to Newfoundland, about Myan mythology, that batcaves of Aruba, the eel-infested waters of Lake Ontario, Marilyn Bell, the swimmer. The human and the cosmic are read against each other in an expansiveness of time and space. This book is for anyone interested in ocean life. The poems are both lyrical and epic. Cover Detail: Down Way Too Deep, a diptych painting by David McClyment. Each day on the beach the horses appear. There are four of them, and a man. four toes on each front foot, and three on each hind, just like a guinea pig. behind his toes, and not on his little hooves. It took fourty-four million years for the dawn horse to lose all those toes. and its teeth became grazing teeth, and the rest is horsestory. The man would slip the bridles off each horse. the fourth, a slender, fast-moving chestnut thoroughbred. and rub up and down his back. as the sun fell into the embrace of the Caribbean sea.